Back in the 1980s, SEGA had established itself as one of the best arcade developers. In the home console market, SEGA was trying to establish itself with its own console and lineup of games. Before the days of the SEGA Genesis and Sonic The Hedgehog, they had the Master System and Opa-Opa, the flagship character of the Fantasy Zone series. 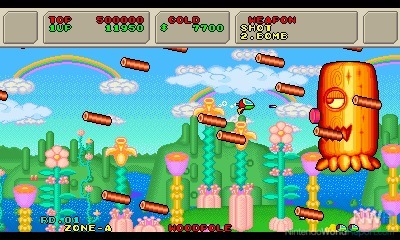 Opa-Opa was one of the faces of SEGA during the 80s and is the main character of the Fantasy Zone series. 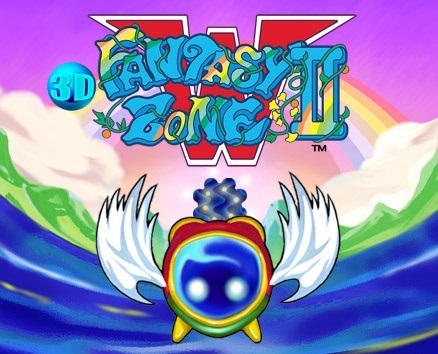 3D Fantasy Zone II W (pronounced as 3D Fantasy Zone II Double) is the latest iteration of Fantasy Zone II. Is this the definitive version of the second game in the series? 3D Fantasy Zone II W is not a port of the Master System or arcade versions, it is a remake that was first on the PlayStation 2 in Japan and then was ported over to the Nintendo 3DS. 3D Fantasy Zone II is faithful to the original version, but is based on an emulation of SEGA’s System 16 board and not SEGA’s E Board. It was graphically enhanced with the emulation of the SEGA 16 board. The game sticks out visually with its bright and colorful environments. 3D Fantasy Zone II is a 2D horizontal side-scrolling shooter. 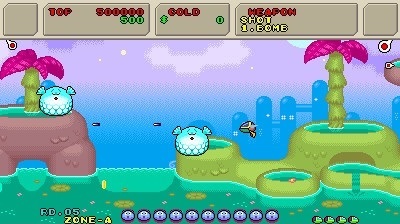 Unlike other shooters at the time, Opa-Opa is not forced to move to the right at all times. Players have the freedom to move Opa-Opa in any direction. The goal is to destroy all the bases in each level and any enemies in the way. To survive throughout the game, it is crucial to figure out when it is best to fight against the enemies and when it is best to flee from them. Each level has a Bright Side and a Dark Side version. Bright Side levels are marked as Zone A and Dark Side levels are marked as Zone B. The differences between them lie in the difficulty and rewards. Zone A is less difficult, but destroyed enemies will not produce high rewards. Zone B is more difficult with enemies being more aggressive in both their attacks and patterns. Destroyed enemies and bases in Zone B will produce more coins. Traveling between the two sides is as simple as warping to them. Certain bases will reveal a warp to either the Dark Side or the Bright Side. At certain times, a shop will randomly appear. By flying to the shop icon, players can purchase upgrades for Opa-Opa. Some upgrades, such as the engine and secondary weapons, will be permanent, while Opa-Opa’s primary weapon will last for a limited period of time. This is indicated by a bar at the top of the screen. Once the bar is empty, Opa-Opa will revert back to the default weapon. If Opa-Opa dies, all the upgrades will have to be bought again. Once all of Opa-Opa’s lives are gone, the game is over. There are two modes in 3D Fantasy Zone II W. First is the story mode, The Tears of Opa-Opa, and the endless mode, Link Loop Land. The Tears of Opa-Opa is the primary mode. Link Loop Land is an endless mode where the goal is to shoot down enemies, destroy bases, and fight the boss in an endless loop on one life. As players collect coins, the multiplier increases. The goal here is to last as long as possible and get the best score. The mode is only playable with Upa-Upa, who plays the same as Opa-Opa, but, as you beat the story mode, there will be two more playable characters unlocked. Opa-Opa takes on anything in his path. The main section of the game is The Tears of Opa-Opa. 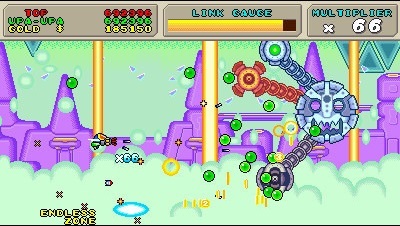 The goal of the game is to defeat the bosses throughout eight levels and, then, defeat the final boss in the ninth level. The game has three different endings. While players never have to visit the Dark Side during the game, it is required if they want to obtain the best ending. As a bonus, any coins leftover from a run of Fantasy Zone II is added to the coin stock. The coin stock unlocks different enhancements such as the ability to extend the time of weapon upgrades, reveal enemy base markers and shop markers, and increase the number of coins dropped by enemies. As for the controls, Opa-Opa can shoot both a primary and a secondary weapon. If Opa-Opa has a third weapon, simply holding the secondary weapon button will charge it. Once it is charges, the third weapon will be fired. There is also the option to use rapid fire controls for Opa-Opa’s weapons. The music throughout the game is well done, but it’s not the original music. 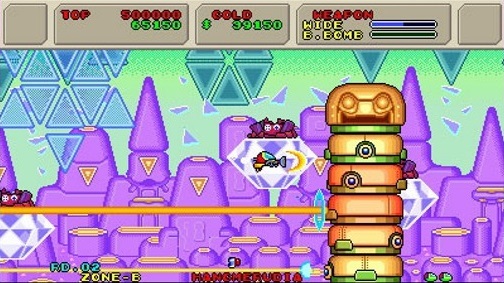 Many of the tunes were composed from scratch and are faithful to the restrictions by the technology during the original release of Fantasy Zone II. There is a lot of synthesis used in the tunes. While purists will balk at M2 and SEGA for not sticking to the original compositions, I am OK with the changes in the musical score. 3D Fantasy Zone II is the definitive version of Fantasy Zone II. 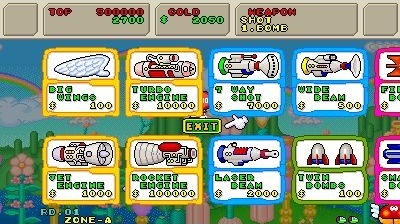 With the upgrades in both the gameplay and the visuals, Fantasy Zone II is worth the price of admission. The game plays smoothly and is a good, yet fair challenge. With the ability to change the number of lives, the difficulty, and enhancements, players can either casually enjoy 3D Fantasy Zone II to enjoy the story or give themselves a challenge. While some purists will balk at the upgrades, I welcome them with open arms. This is the most accessible version of Fantasy Zone II out in the market. Review copy supplied by author. It took 2.5 hours to complete the Tears of Opa-Opa, with a total of four hours spent playing the game.